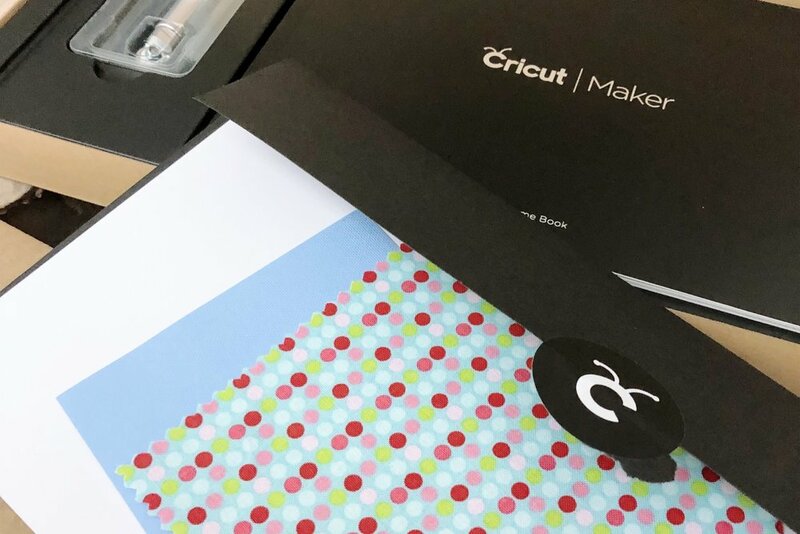 The Cricut Maker is here! Cannot wait to show you what’s inside. Cricut Maker is packaged to impress. The box exterior shows off a glittering champagne lid on a sleek white machine. Wow. I’m a sucker for good package design! The first thing you see inside is this small “Let’s get started” box. Simple and direct instruction, right on the box. Good move! There is a Welcome Book and some thoughtfully-packaged materials to complete your very first project! Both of these are items I can completely appreciate because although I’m not new to the cutting-machine game, I am completely in the dark on Cricut Maker capabilities. Did you know this thing can cut balsa wood? Ya, me neither. Next post: balsa wood! These materials included for a first-project were so thoughtfully packaged inside a sealed black envelope. I’m impressed by the out-of-the-box project idea because I had no idea where to begin. I was thinking of cutting one of my own designs, but wasn’t sure if I would be in over my head. Under the instructions, the Cricut Maker was wrapped and sealed with another little logo sticker and two cut mats. 1. The Welcome Book is welcoming! This machine has detailed instructions in a handy Welcome Book to describe material and project possibilities, what’s included in the box, other compatible tools available for purchase, a quick reference guide and links to further educational material. The oversized photo and description for each blade, scoring tool and pen are helpful to identify available tools and appropriate materials. I’m not the kinda girl who reads instructions. My first instinct was to jump right in and cut one of my own designs. That didn’t happen. The set up process led me right to a sample project and in the end I was glad it did. 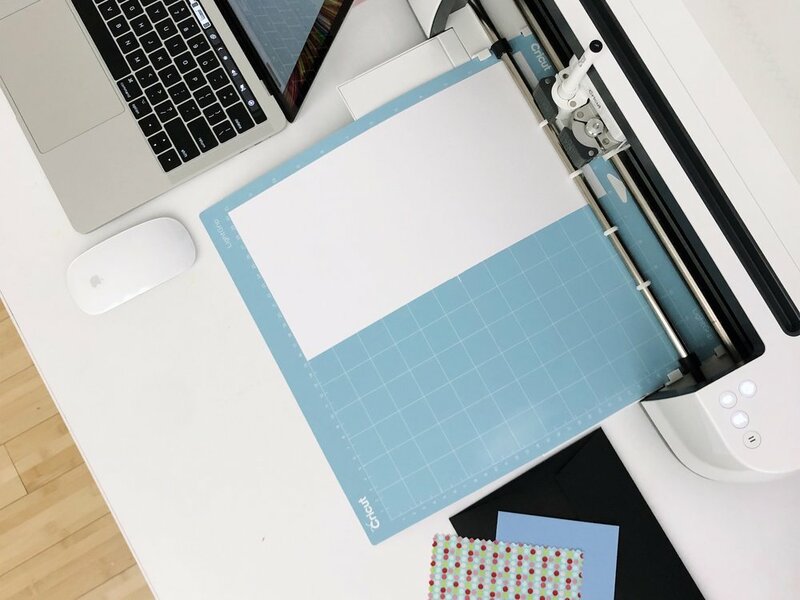 The included greeting card project introduced me to cutting ready-to-make projects, setting materials for cutting, loading a pen and blade, inserting a mat and actually making a complete project. The Design Space leads you through the first project completely with on-screen instruction. I keep my cutting supplies in a nearby drawer, but was so excited to see that the Cricut Maker has a ton of storage inside! I was able to fit all the supplies that came with the Portable Trimmer inside the storage compartment. I had to move on and cut one of my own designs. Props to the Design Space for being user-friendly. I managed to upload this hand-lettered monogram for my notebook cover as a PNG and set it to cut in Glitter Vinyl within a few minutes. To see the finished notebook cover, along with a delicate hand-drawn hibiscus flower (both cut in vinyl!) check out this post on Instagram.